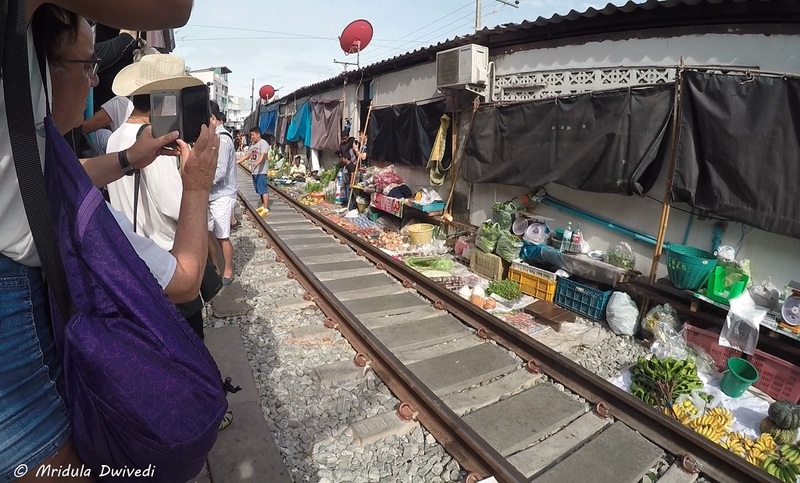 I have been lucky to visit the Maeklong Railway Market near Bangkok twice, the first time in 2016 and then in 2018. I was not too thrilled with my photos on the first trip. But the second time around I was better prepared. 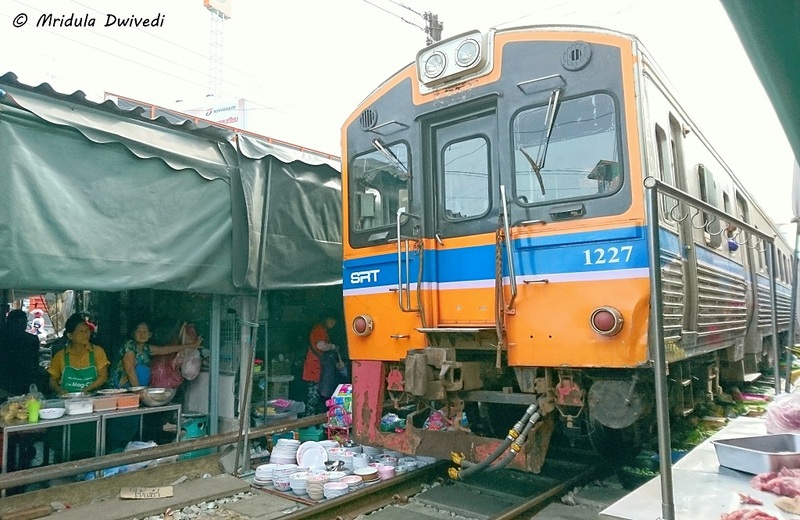 So, this post is about photography tips for Maeklong Railway Market near Bangkok. If you know about the Railway Market, you can skip this paragraph and go straight to the photography tips below. 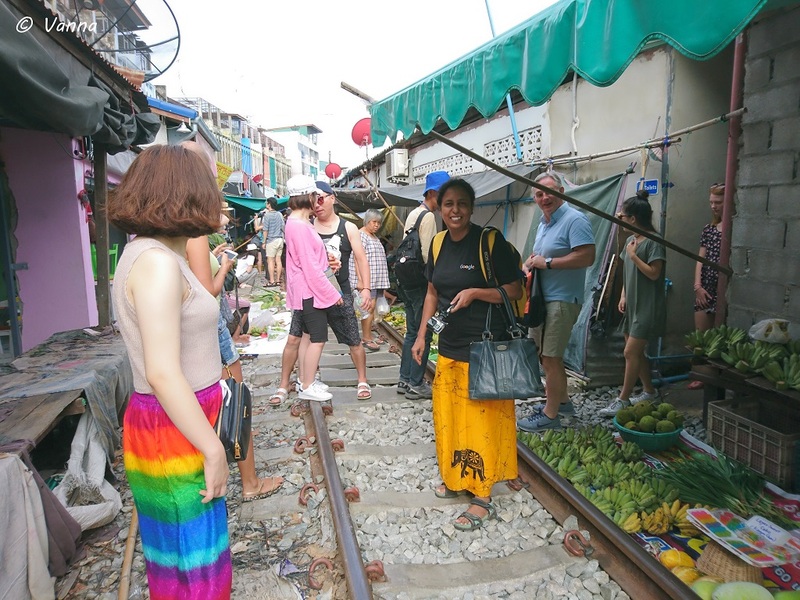 Maeklong Railway Market is on the either side of the Railway Tracks and the umbrellas cover the tracks! They are taken down to allow the train to pass and put back immediately again. This is the most exciting time to be at the market, when the train passes through it. The train schedule for 2018 is, please double check for the timings and be prepared for delays from the schedule. Train Arrivals are : 8.30 a.m., 11.10 a.m., 2.30 p.m. and 5.40 p.m. Train Departures are: 6.20 a.m., 9.00 a.m., 11.30 a.m. and 3.30 p.m. It is about 80 km from Bangkok. You can also stay at Amphawa and enjoy the nearby areas. Now to the photography tips! 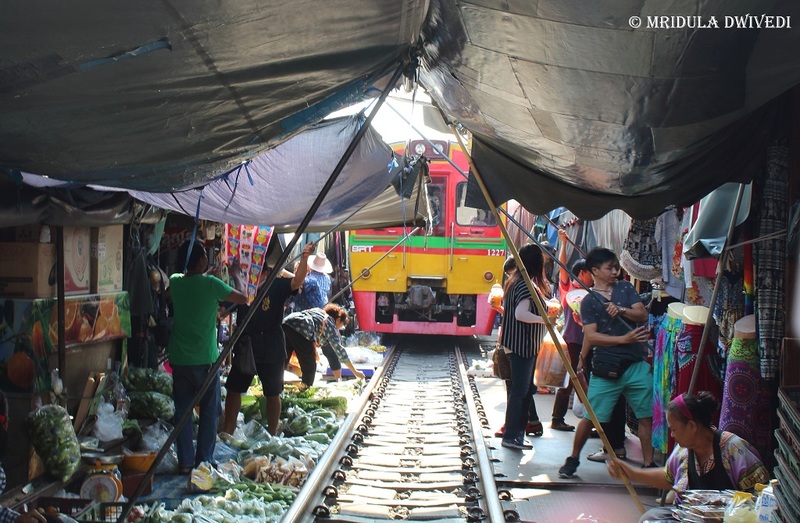 Maeklong Railway Market is a crowded place. I visited it in the morning for the 8.30 train, on both the trips and it is teeming with people even in the morning. They are everywhere, they will be in your frame as you will be too. So, decide carefully where you wish to place yourself when the train passes. 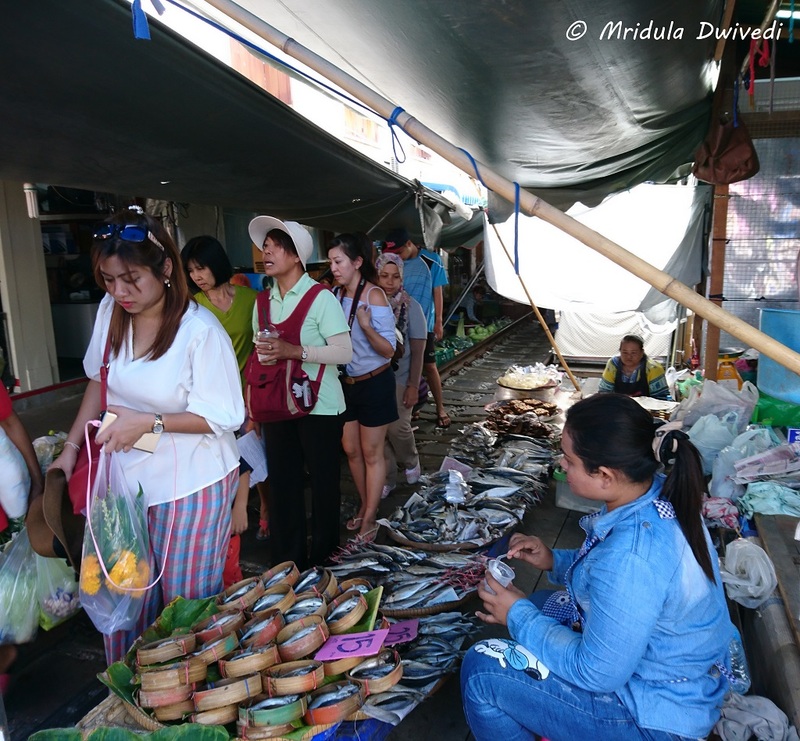 When the market is on the railway tracks and the umbrellas are up, you might notice the smell of sea food and meat if you are in the middle of the market. I am a vegetarian and not particularly fond of that smell. The first time I was unprepared and it bothered me. The second time around I knew what to expect, so I moved quickly through the middle and the smell did not affect me so much! 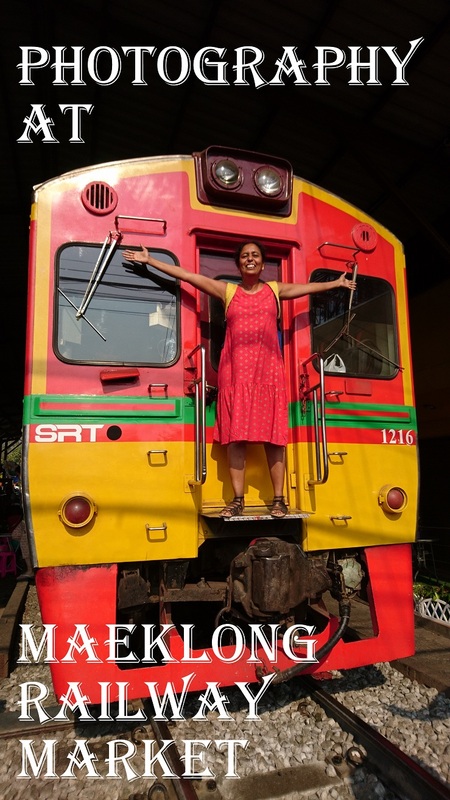 I would recommend standing at the Maeklong Railway Station end or near the crossing so that you have some freedom to move. The 8.30 am train goes to the Railway Station and goes back at 9.00 am through the market again. If I have to do it again I will stand away from the station at 8.30 am and close to the station at 9.00 am. If you are near the station before 9.00 am you get to climb up the engine too which in my opinion is a bonus. When the train starts moving at 9.00 am you can stand on the track as soon as it has crossed your end. Be ready, everyone else has the same idea too. 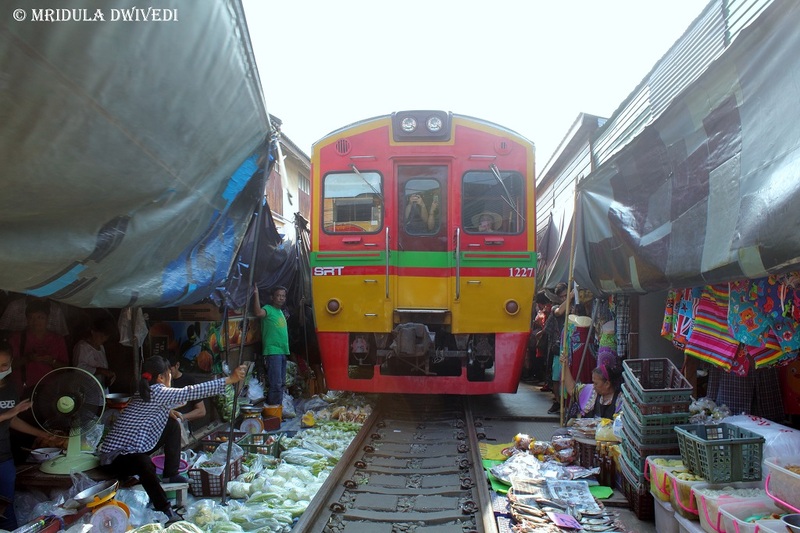 So, for a few seconds you get to to photograph the market standing right on the tracks with the train in full view. You cannot do this from the far end for the departing train as you can get on the track only after it has crossed the market! For the 8.30 am train the reverse is true, you are better off away from the railway station as you can come on the tracks as soon as the train has crossed your end and moving toward the railway station. Do whatever but don’t get stuck in the middle. If you get stuck in the middle, there will be a thousand cell phones in your frame, you can make a creative use of that too, but it was not my favorite spot for clicking the market while the train is passing through it. While it is entirely up to you what you wish to create but I found it difficult to do both. On my first trip I was able to do only a video, on my second trip I ended up with photos only! The video above is from the 2016 trip. Unless you mount your video camera some place chances are you can’t do both. On my first trip I did a video and took out the stills from the video. The second time around I used my DSLR and forgot to take a video. Also I forgot to sit down and alter the perspective while the train was passing through the tracks! If I go there yet again I will sit down to take a few low angle shots! That is all from me at the moment. If you have a tip to add please do so in the comment section! PS. 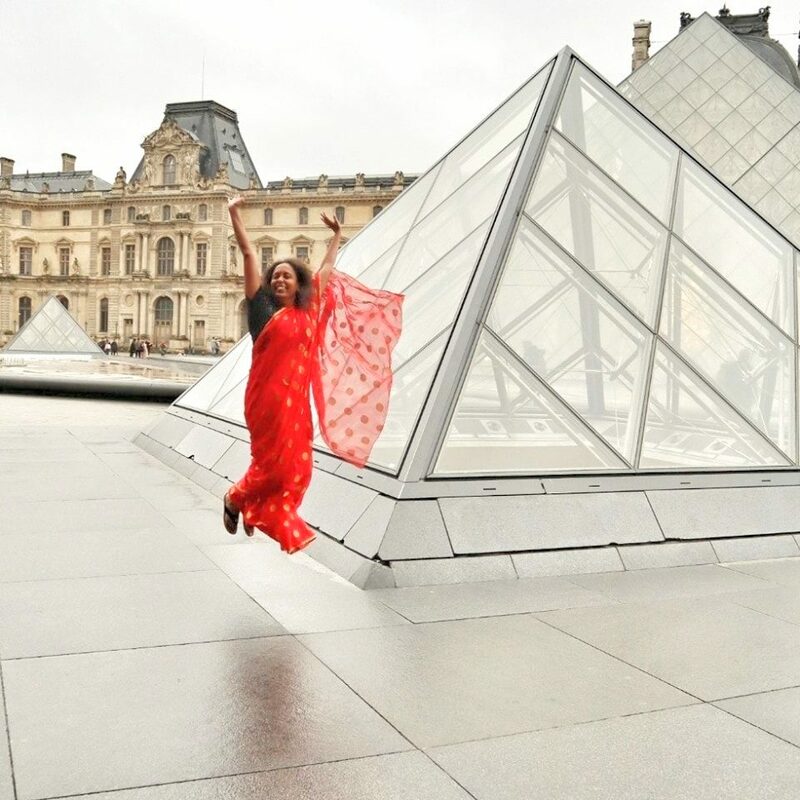 I was invited to visit Thailand by the Tourism Authority of Thailand, New Delhi. This was my 10th trip to Thailand. 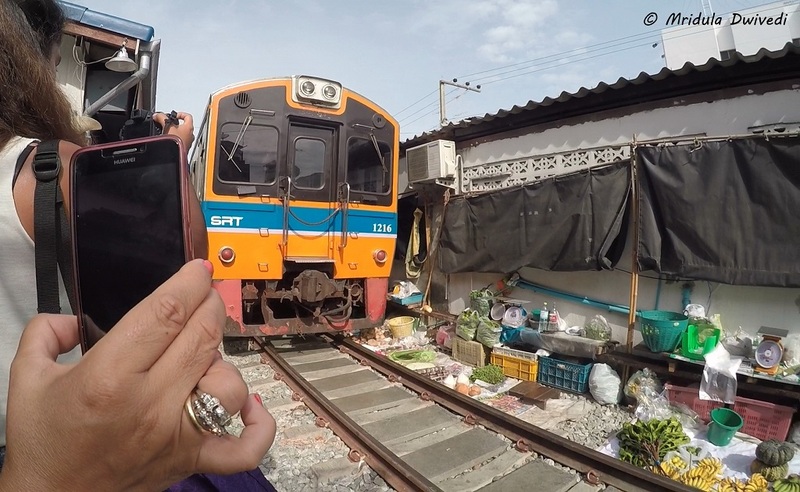 I first saw a video of Maeklong Railway Market on Whatsapp. And I almost refused to believe it. A few months later I was standing at the market known as Talat Rom Hoop (ตลาดร่มหุบ) locally, about to witness the phenomenon myself! The local name means “umbrella pulldown market” as that is what the vendors do when the train is about to pass through! The market must have existed before the railway line came through in early 1900s. Even today there is gap in the line which has to be covered by ferry between Mahachai and Ban Laem stations. 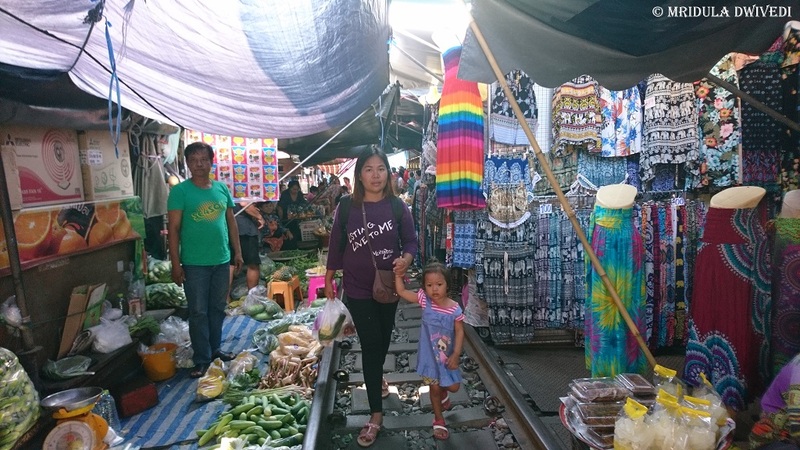 The market is next to the Maeklong Railway Station. When we arrived, we had a just a few minutes before the 9.45 am train passed. 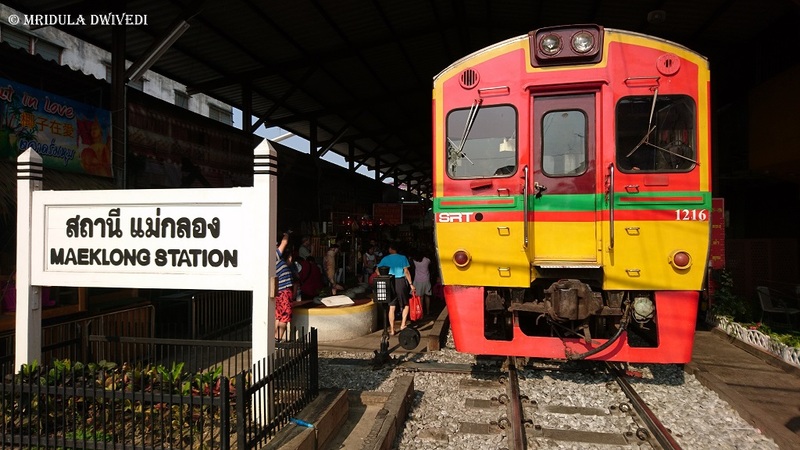 The same train comes back at 10.20 am from the Maeklong Station. To look at the schedule of the trains you can click here and read. Looking at the number of tourists who were there, the market is clearly popular. I could hardly get any room to click pictures! Before the train arrives at the market, you roam around the market like you will at any other place! There are fruits, sea food, meat and other stuff to be bought. There are a lot of tourists all looking for good pictures too. So yo will be in the frame of many other people, as they will be in your’s! Urging to Clear the Tracks! You will see the umbrellas or the awnings of the shops come down! You will also see a few vendors clearing the track. They urge all the tourists to get out and stand on the sides, at least a foot away from the main track! They are quite vigorous in shooing people away and rightly so, because the consequences of staying on the track are not pretty at all! By the time they make sure everyone is safely off the track, you can already hear the horn clearly. The last of the vendors go off the track just as the train is approaching. When the train passes through, you of course, stay out of the tracks! You also try desperately to keep your camera clear of other tourists. I only partially succeeded in it! And however great the temptation for a good picture, you firmly remain in the place which managed to occupy before the train came in the view. You have to resist the impulse to yell at the person who put their camera in your frame, because you must be doing the same to the person next to you! From photography point of view I only managed to use my cell phone and Gopro. It didn’t help that I was completely new to GoPro then! After the train has passed, you go back on the tracks again, the market comes back too! I was vehemently disappointed with my pictures when I clicked them in August 2016. After putting some distance between the event and my pictures, I am a little more charitable towards them. 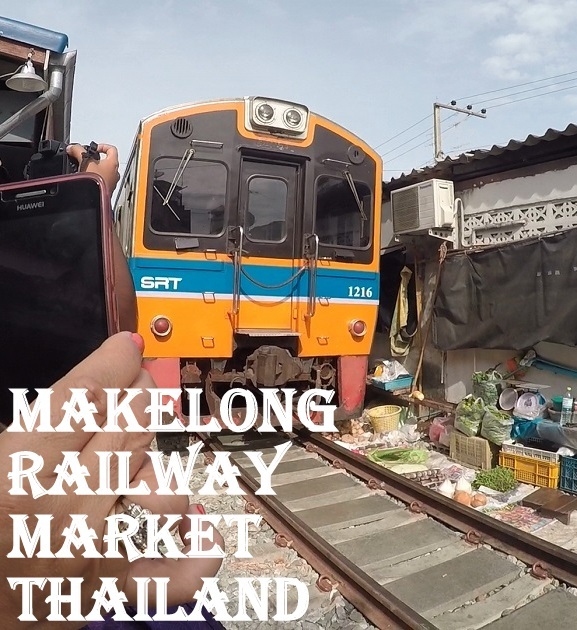 Maeklong Railway Market was an intense experience for me. How I wish to go back, now that I know what to expect out there! I promise I will come back with better pictures and videos if I ever go back again.